My mom made this delicious Lemon Mascarpone Pudding over the weekend. It doesn't look like much in the picture, but trust me, it was sooo good! 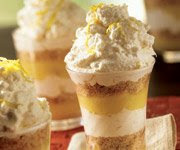 It features two of my favorite dessert components: a cookie crust AND lemon curd. Just add some mascarpone cheese and you've got the perfect summer treat! Oh, and my mom put it in a bowl, instead of parfait glasses, so everyone was free to scoop out as little . . . or as much as they wanted. For the complete recipe, visit Relish magazine's Web site. This might be the best dessert EVER!!!! It is absolutely wonderful with fresh berries. Don't make the mistake of baking it, like me and my drunk friends....though I have to say it was still tasty! Make it NOW!!!! Looks delicious! It's so cool to have a dessert with lemon paired with something rich like cheeses! Love them! Thanks for the post!